Learn how an abusive lawsuit is part of a dangerous trend of companies trying to silence dissent. 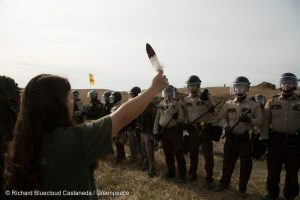 Energy Transfer Partners (ETP) – the company behind the Dakota Access Pipeline – has filed a lawsuit against Greenpeace and others, in its latest attempt to silence advocacy work and attack the fundamental right to free speech. 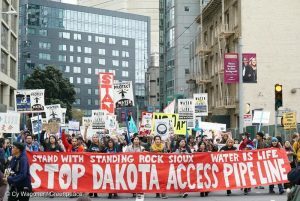 In response to the powerful alliance of Indigenous communities and climate activists who stood in opposition to the Dakota Access pipeline at Standing Rock, ETP has filed this SLAPP lawsuit claiming nearly a billion dollars in damages. on behalf of Energy Transfer. Here’s what you need to know about the suit. 1. What is a ‘SLAPP’ suit? SLAPP stands for “Strategic Lawsuit Against Public Participation.” As the name implies, corporations, using this tactic are trying to shut down public participation. SLAPPs are generally filed without any kind of legal merit. The purpose of a SLAPP is to censor, intimidate, and silence critics by burdening them with legal claims and costs until they’re forced to abandon their criticism or opposition. 2. Why is ETP using a SLAPP? ETP is SLAPPing its critics in an attempt to shut them up – or even better, to shut them down. ETP is suing Greenpeace for at least USD $900million. The corporation’s hope is that the prospect of having to pay this – or at least of spending a lot of time and legal costs on fighting the lawsuit – will intimidate Greenpeace and others into silence. The goal of this suit is to silence opposition by misrepresenting what happened on the ground at Standing Rock — making outrageous and racist claims that big environmental organizations like Greenpeace orchestrated the Indigenous-led movement at Standing Rock. In 2016, Canadian company Resolute filed a SLAPP suit against Greenpeace, which was dismissed in full by a US federal judge. But the use of this dirty tactic by corporations is on the rise. As we face an upswing in a new global right-wing agenda, governments and corporations around the world are attempting to chip away at free speech. And it’s not just about environmental groups, either. The SLAPP suit is designed to send a loud message so that any activist or public-interest advocacy group that takes on giant corporations will have to think twice before standing up for what they believe in. Just like the Resolute case, this one was filed by Michael Bowe. Bowe is also a member of Trump’s personal legal team, and part of the law firm Kasowitz Benson Torres – founded and run by Marc E. Kasowitz, Trump’s personal lawyer. The Times once described Kasowitz as “the Donald Trump of lawyering”. Bowe has publicly stated that he’s in conversations with other corporations considering filing their own SLAPPs against Greenpeace – suggesting this bullying and anti-democratic tactic is being shopped around to the highest bidder. 5. This is not a one-off. There are many, many examples of SLAPP suits, here are a couple you may have heard of. Earlier this year, coal magnate Bob Murray sued John Oliver after Last Week Tonight ran a segment on Coal – which prominently featured Murray. In the last 15 years, Murray and/or his company have also sued various other journalists. The ACLU represented individuals in Uniontown, Alabama — a poor town predominantly made up of people of color — who were sued by Green Group Holdings for $30 million for standing up to a coal ash landfill in their town. The company revealed its motives when its lawyers approached the individuals in an attempt to cut a deal – if they agreed to give Green Group access to their electronic devices, access to their future social media postings, and extensive details about their group’s membership, advocacy and communications with other environmental groups. 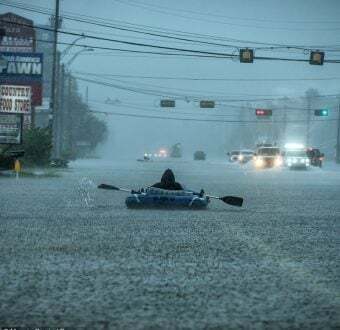 Due to public outcry and the support of the ACLU, the residents reached a settlement in February and Green Group Holdings agreed to better environmental protections — but they shouldn’t have had to deal with this corporate bullying in the first place. There are hundreds of others across America and beyond who won’t be so lucky. People march in support of the Standing Rock Nation at the Civic Center Plaza of San Francisco. The protest was one of many in a global day of action against the Dakota Access Pipeline (DAPL) calling on the U.S. Army Corps of Engineers to cancel the permit for the project. ETP and other corporate bullies are blatantly trying to stifle free speech and our right to peacefully protest. So let’s show them that that’s not going to happen: Refuse to be silent. Defend free speech. And let’s continue standing up for what is right. You can take action against this SLAPP here and find more information about how you can fight back against SLAPPs generally. Molly Dorozenski is a Project Leader at Greenpeace US, where she has worked for eight years in creative and strategic communications. She has planned and executed comprehensive communications campaigns including campaigns on climate, the Arctic, the Gulf Oil Spill, as well as a variety of corporate campaigns that helped move companies towards more sustainable practices. In 2015 she received an Effie Award for work with the VIA Agency that pushed tech companies to commit to using more renewable energy.